I don't make resolutions, but I do try to maintain any good habits that I may have picked up in the previous year. Currently, that's journaling. I started in April 2017, and I haven't been consistent, but I am working on it. That, and going to the gym. Love snow or no snow? Snow is for visiting. And throwing snowballs. And a good reason for drinking hot chocolate and marshmallows while reading a good book. Not for shoveling, and being snowed in, and being frozen in, and cleaning up the salt that the dogs track in. Let's just say I am ambivalent about snow now that I have to live in it. It is not just a pretty backdrop. Name a new place you want to go this year? Would you rather have a new haircut or hair color? Given the investment in my Sisterlocks, new color. I'm thinking purple. Name one special thing you want to do for yourself this year. Lose weight. I have no idea why it isn't coming off and I am beyond frustrated. Your least favorite thing about January? The cold. And grey. The sense that things should be new, but they aren't. January is actually kind of depressing. And #1, remembering to change the date on everything from the previous year. 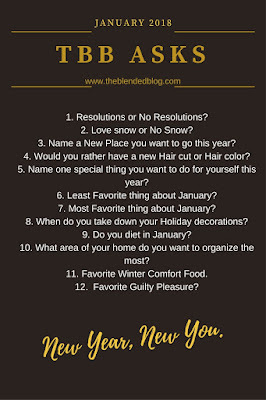 Your most favorite thing about January? I don't have a favorite thing about January. Oh, wait, I do use it to reboot my Project 365. I try every year and have yet to finish one, but I do like to try. When do you take down your holiday decorations? Between the 1st and 6th. Do you diet in January? Nope. I might get back to healthy eating, but I refuse to diet (pay no attention to the #januarywhole30 I'm half-heartedly doing). I do believe in (permanent) lifestyle changes instead of diets. Diets don't stick. What area of your home do you want to organize the most? My side of the home office. It needs a lot of work and I want to enjoy working in a space that is supposed to help me achive my creative (and practical) goals. As a kid, it was ice cream, now, it's brownies. But because of lifestyle changes, I hardly ever eat them. I don't crave them like I used to. Nothing about pleasure should ever make you feel guilty. 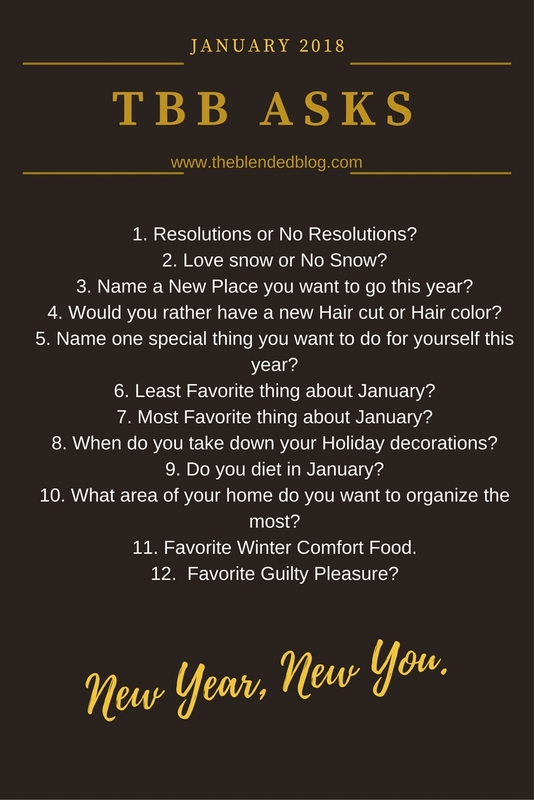 Welcome to the first TBB ASKS of 2018! Link-Up your fabulous answers with us and visit some friends to see theirs!